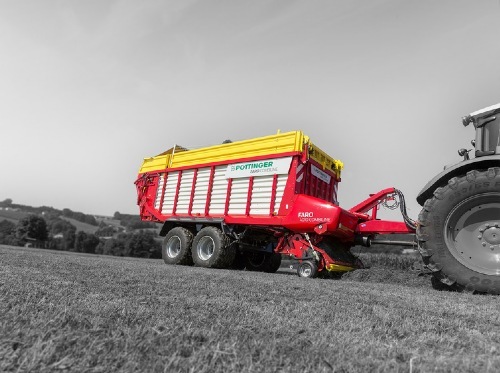 The high-performance TORRO fulfils all your needs in cost-effective silage harvesting. 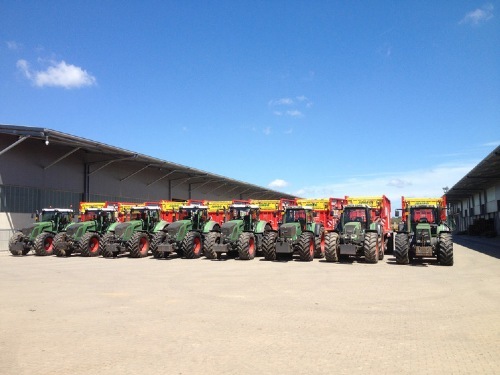 Powerful, robust and strong with a high output – that’s what you’ll get from these machines. Number of scraper floor chains 4 pcs. 4 pcs. 4 pcs. 4 pcs. Number of knives max. 45 pcs. 45 pcs. 45 pcs. 45 pcs. Number of scraper floor chains 4 pcs. 4 pcs. Number of knives max. 45 pcs. 45 pcs. 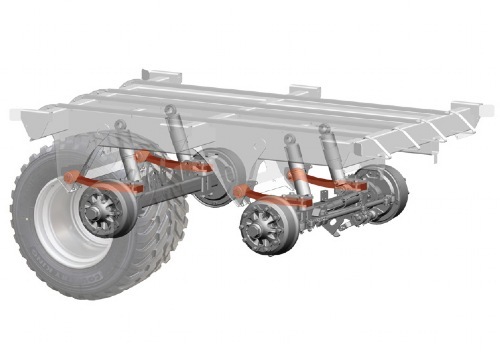 A turning angle of up to 60° is possible even with steered axles, dependent on the tractor and tyres thanks to the narrow design of the drawbar. All hoses and cables are routed tidily through the hose holder. Choose 2.0 t, 3.0 t or 4.0 t supported load, drawbar shock absorber is fitted as standard equipment. 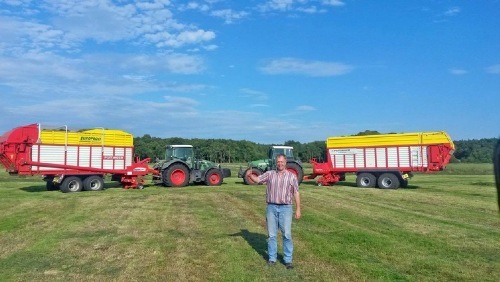 System complies with DIN ISO 26402 and guarantees wagon follows in tractor's tracks on slopes and in the clamp. Track rod with automatic interlock for single-handed attachment. A high level of stability when driving at high speeds and the best manoeuvrability in tight corners is ensured by the speed-dependent steering angle adjustment system. In the field, a tighter turning angle ensures greater manoeuvrability and protects the ground. At high driving speeds, less of a turning angle ensures a higher level of safety. Tandem and tridem axles only require a single track rod control. Load sensing, air brakes and 26.5" tyres are required. Compact design without mechanical components. Axles can be locked by pressing a button on the terminal. The frame components are constructed using high quality QSTE fine-grained steel. The frame and side pillars are secured using fine threaded bolts – no welds. Closely-spaced pillars and high-strength side profiles ensure the highest strength. Clear inside width of 2.30 m.
Smooth wall panels with a special coating ensure the wagon is completely empty of forage after unloading. Tailgate opening angle can be adjusted as required from the tractor seat. Enter the wagon's loading chamber using a convenient access ladder. Floodlights mounted on the front panel provide excellent illumination of the loading chamber in the dark. Roof ropes with rear tarpaulin for retaining crop material with a low density. Roof rope release system in conjunction with the hydraulic folding loading flap. LED package 2 (loading chamber and two reversing lights). LED package 3 (loading chamber and two reversing lights, two for pick-up, one for knife bank). Video system with monitor and one or two cameras. The driveline is designed for high outputs. TORRO loader wagons are designed for tractors of up to 300 hp. These new models are driven by a PTO shaft with a wide angled joint and a cam-type clutch to protect the driveline. The large-dimensioned oil filled rotor side drive gearbox is completely maintenance-free. The bearing is located on the rotor support frame between the rotor and transmission to protect the bearings and transmission. The driveline is protected to an impressive torque of 2300 Nm, corresponding to a peak performance of 221 kW / 300 hp. This represents an increase in performance of 10%. A sensor on the rotor gearbox measures the drive torque and can be precisely adjusted to the type of crop. 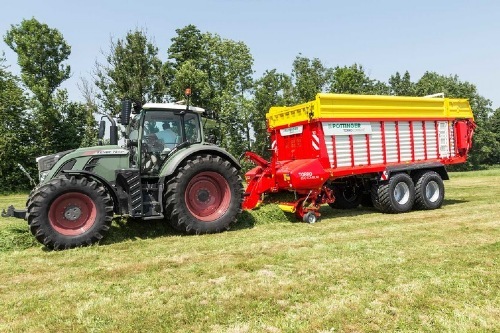 During loading, the torque sensor on the gearbox together with sensors in the front panel and the automatic loading flap control the scraper floor to deliver complete forage protection without leaving the tractor seat. 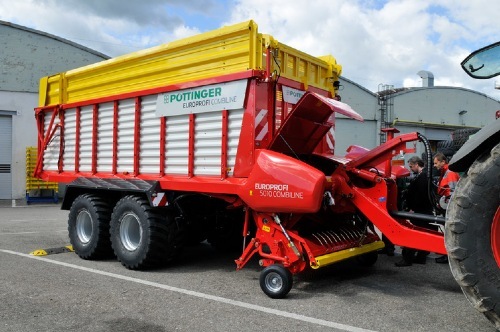 All PÖTTINGER silage wagons are load-sensing compatible. The required oil flowrate is precisely measured and adjusted to demand. This prevents the oil from heating up and reduces the power requirement by up to 20 hp (15 kW). The driveline to the beater rotors is concealed within the frame. The high-strength drive shaft is protected by a cam-type clutch set at 1700 Nm. 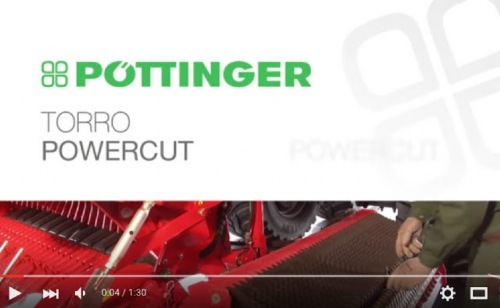 The PÖTTINGER floating pick-up, with six rows of tines, delivers impressive performance. A reliable and high intake pick-up is still achieved at high forward speeds and in difficult harvest conditions. Two jointed support arms ensure the pick-up has complete freedom of movement. A spring alleviates the pickup weight so less pressure is exerted on the ground. Height-adjustable 16 x 6.5-8 trailed jockey wheels contact the ground on precisely the same line as the tines to ensure perfect ground tracking and cornering. Unique travel of 180 mm for perfect ground tracking and exact contouring. Automatic pick-up reel switch off on TORRO D models with beaters. 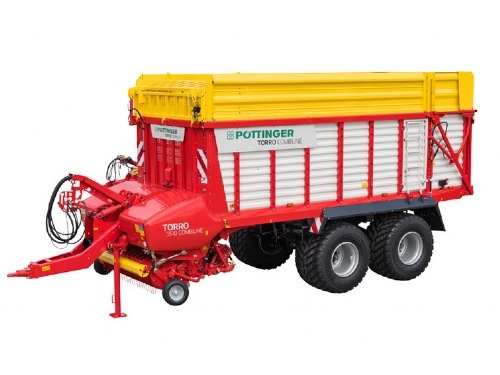 The PÖTTINGER pick-up guarantees the maximum feed rate. A large swath roller with crop transfer rods ensures perfect crop flow and a high loading speed. The transfer zone from the pick-up tines to the rotor has been optimised and adapted to high throughput. 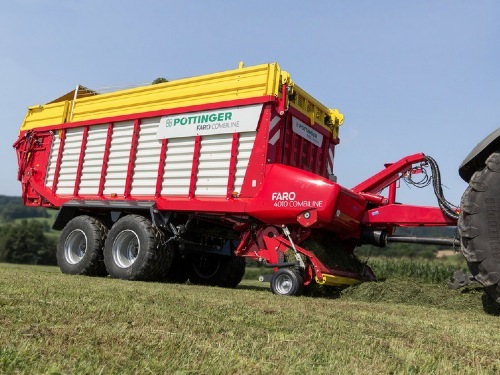 The rotor conveys the forage smoothly through the chopping system and into the load chamber. The pickup is controlled from both ends by a steel cam track. The sealed twin-race roller bearings fitted to the cam rollers are designed to withstand high stresses. Clean forage is the result thanks to reduced speed and controlled tine movement. The tines are slightly trailed to sweep in a controlled arc and adapt ideally to contours. Perfect transfer to the rotor in all conditions with fully active tine length up to withdrawal point. The forage is not dragged through, so there is less longitudinal alignment of stalks. The result is a much improved chopping quality. The cam track only needs to be greased once per year. The main bearings have a lubrication interval of 80 loads and are easily lubricated without having to remove guards. This newly-developed additional tracking roller is located behind the middle of the pick-up on PÖTTINGER loader wagons. Being located in the centre prevents it from sinking into tractor wheel marks and as a result guarantees perfect ground tracking. The parallelogram guide linkage ensures significantly improved contour tracking for clean forage, even in difficult conditions. 100% freedom of movement of the pick-up is ensured. Adjustment is independent for the front jockey wheels. The additional tracking roller is raised with the pick-up. Full ground clearance is still ensured. POWERMATIC PLUS is the heart of TORRO series loader wagons. Rugged and powerful, the rotor delivers high output chopping and compression. POWERMATIC PLUS represents smooth, fuel-saving penetration of the crop and perfect transfer from the pick-up. The loading rotor has eight rows of tines arranged in a spiral and a diameter of 800 mm. The loading rotor is mounted on self-aligning ball bearings at both ends. The bearing is located on the rotor frame between the rotor and transmission to protect the bearings and transmission. Wide surfaces on the tine points ensure maximum performance even with wet and short forage. The optimised tine shape and large scraper surface ensure the best possible compression in the loading chamber. The conveyor tines are made of hardened fine - grain Durostat 500 and are 10 mm thick. The tine rings are hooked into the central drum and welded around the circumference for exact positioning. The scrapers have an 20 mm wide rear face and are individually mounted and bolted. They ensure highest possible compression, depending on how the automatic loading system is set. The forage is chopped right through exactly and uniformly. The chopped material is ideally structured for ruminants. An optimum distance between the knives and tines ensures smooth operation and protects the knives from foreign objects. The newly-developed and patented geometry of the reversible TWINBLADE knife doubles the service life. A continuous perfect chop is ensured while replacement knives are always on-board. This unique swing-out knife bank makes light work of changing the knives. Press a button on the side of the wagon to move the knife bank support arms downwards and release the chopping system. Now you can simply pull the knife bank out alongside the wagon - a unique system. Press the central knife release button to disengage the knives so they can easily be removed without the need for tools. The knife retention springs and tilting levers are recessed safely out of the way. This greatly reduces the contamination of the knife holders. The chopping system can be tilted out directly from the tractor seat to clear any blockages. The knives are produced from hardened tool steel and their pressed serrated edge ensures a precise chop. The extra thick rear edge of the knife guarantees an extended service life. New: Extra strong DURASTAR knives for stony soil. 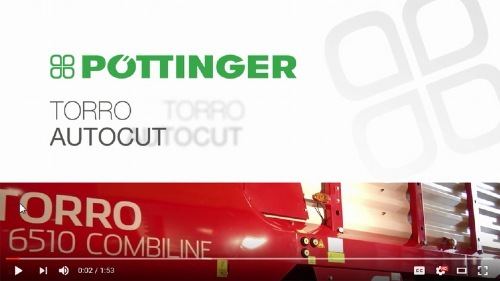 PÖTTINGER protects the heart of the loader wagon with a patented individual knife protection system. Foreign bodies are a danger to the rotor and chopping system plus downtime can be expensive. The triggering force is adapted to the high throughput capacity. The knives are held securely in the correct position to make sure that a consistent chop length is produced. Larger foreign objects only move the knife briefly in the direction of crop flow. The trigger roller is lifted out of its holder at the back of the knife. The resistance of the knife is suddenly reduced so that the knife can allow the foreign object to pass through virtually unobstructed. The sharpness of the knife is retained. The knife is then automatically brought back into the working position. Any stones in the forage are not pulverised like they are in harvesters. 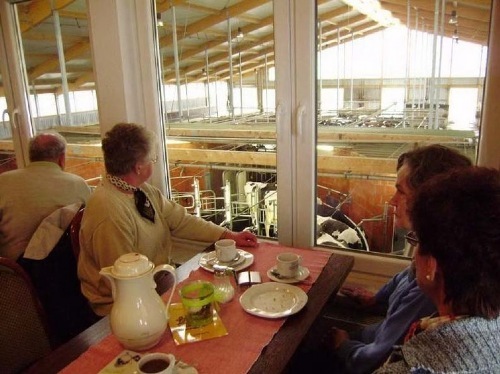 The cattle leave them in the trough so that injuries to the digestive system are avoided. 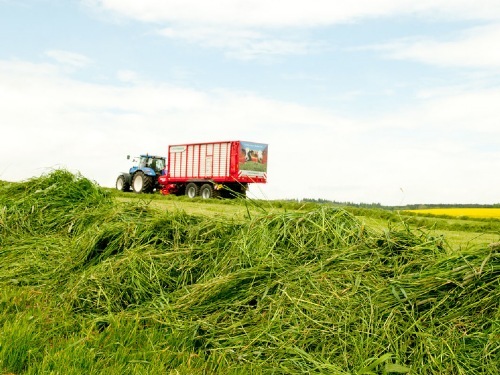 A precise and consistent chop is the basis for the best silage quality. 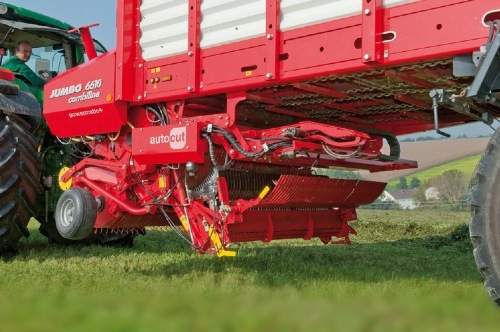 AUTOCUT delivers consistent chopping quality throughout a whole working day. The AUTOCUT knife sharpening system enables convenient knife sharpening directly on the loader wagon. Depending on the wear of the knives, simply select the sharpening cycle using the control terminal. This considerably reduces maintenance expenses and at the same time guarantees long-lasting optimal cutting quality with lower energy consumption and increased output. The crop is chopped in precisely the same way again and again, and is not squashed. The steel profile panels are fully enclosed, right to the top. The profiled plates have a special coating to guarantee a long service life. The large surface area of the forage compression flap ensures the best compression of the crop and maximum use of the loading chamber. A halogen floodlight in the load chamber is standard. The automatic loading system guarantees that the wagon is filled right up to achieve maximum transport capacity. The forage is already carefully compressed in the transfer duct to make full use of the loading chamber. A sensor at the lower end of the front panel measures the loading pressure for damp, heavy grass and switches the scraper floor on and off accordingly. 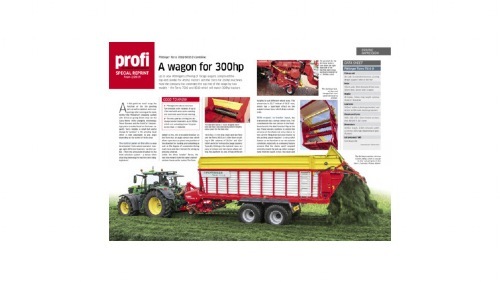 This prevents the forage from being mashed due to excessive load on the loading rotor. The second sensor in the forage compression flap measures the compression inside the loading chamber. 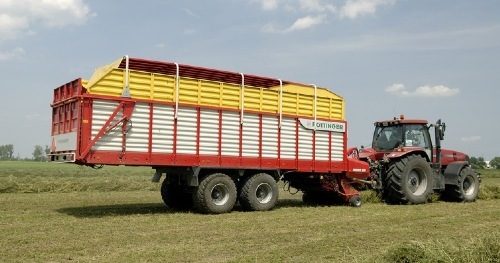 The forage is compressed uniformly and the loading chamber filled to the optimum capacity. The load sensors on the rotor gearbox detects the drive torque. Using the POWER CONTROL operator terminal, the load sensors can control the scraper floor to deliver complete forage protection without leaving the tractor seat. The forage compression flap is equipped as standard with a hydraulic cylinder which can be controlled from the tractor cab to enable a rapid change between pick-up loading and top-fill loading. In loader wagon mode the forage compression flap is folded upwards to control the automatic loading system. Compression is adjustable so it can be set to ideally match the power of the tractor. To make full use of the loading chamber, the forage compression flap is lowered inwards. The optional duct cover prevents crop from falling into the rotor duct while the wagon is being used for transport. 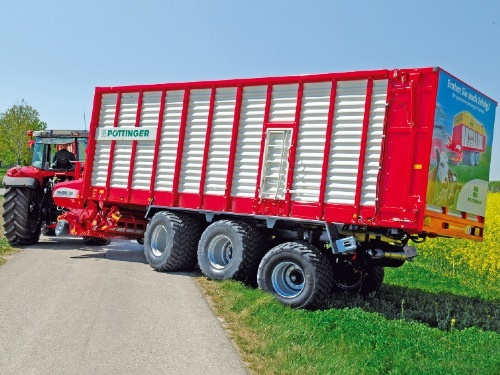 On PÖTTINGER wagons the duct cover simply folds away without any modifications required. 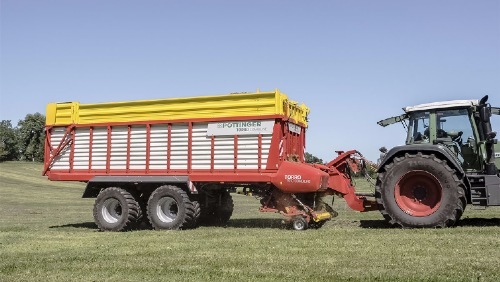 All TORRO COMBILINE wagons are fitted with tapered mudguards and closed frame beams. Nothing is left lying on the mudguards No crop falls onto the road during transport. A press of a button on the control terminal is all that is needed and the full cross section of the tailgate opens to unload TORRO L models in a few minutes. The automatic unloading system makes life easier for the driver and protects the machine. A uniformly distributed blanket of forage is essential for perfect compaction. Two beater rotors guarantee perfect distribution. The aggressive tines deliver an impressive performance even with highly compressed forage. Bars on the rotors ensure maize material can be unloaded effectively. A pressure sensor in the beater rotor bearings controls the scraper floor automatically. The tailgate opening angle can be set to different positions from the tractor seat to minimise the effects of crosswinds. New: Beater driveline protected to 1700 Nm. Easily access central greasing point. Third beater rotor available as an option. The optional cross conveyor belt is 890 mm wide and is powered hydraulically. Runs to left and right. Remote control using optional POWER CONTROL Wireless. The scraper floor has been lowered at the front by 150 mm to accommodate tyres up to 800/45 R 26,5. The forage is conveyed upwards to the rear for uniform and smooth discharge. Hassle-free unloading with a low power requirement and four powerful drive chains ensure rapid unloading. A two-speed motor is standard for unloading speed of up to 18 metres per minute. The scraper floor transmission is located on the centreline of the wagon. The PÖTTINGER scraper floor guarantees long term reliability. The load chamber floor is constructed of pressure treated, durable wood. The tongue and groove boards are bolted to the frame. The hardened bars are offset and easily accessible. The greasing points for the scraper floor shafts are located at the side of the wagon. 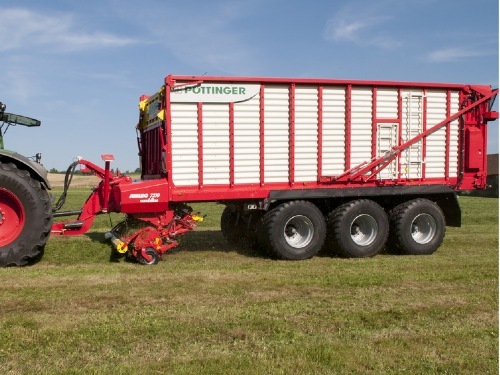 All PÖTTINGER silage wagons are load-sensing compatible. The required oil flow rate is precisely measured and adjusted to demand. This prevents the oil from heating up and saves power by up to 20 hp (15 kW). The compensator arm ensures dynamic equalisation during braking so the same load acts on each wheel. At the same time you are guaranteed perfect suspension characteristics in the clamp and smooth running in the field and on the road. Large spring spacing at front (1100 mm) and rear (856 mm). High strength longitudinal linkages apply the braking and steering force. 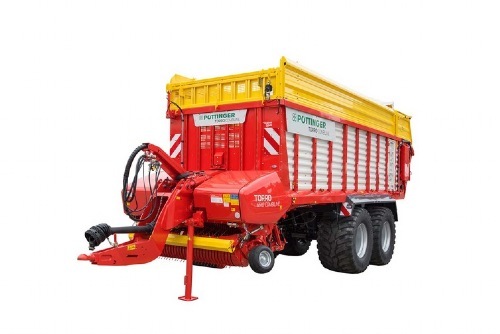 Trailing steered axle protects the sward even with heavy loads (standard). Hydraulic steered axles and EBS brakes available as option. The advantage of the reinforced parabolic leaf springs with additional anti roll bar is improved driving performance on slopes and corners. 20% higher driving stability. The hydro-pneumatic chassis offer a wider wheel spacing of 1085 mm for safe driving characteristics in all situations. The large axle compensation of up to 270 mm is designed to handle challenging field entrances and poor track conditions. Highest level of driving comfort in traffic and off-road. Optimum braking power thanks to equal axle load distribution. While steering or manoeuvring at high speed with a full load or high centre of gravity, there is an increased risk of tipping over. This system detects critical situations by monitoring the lateral acceleration, load weight and driving speed. Automatic braking of individual wheels reduces the speed as well as the lateral acceleration. Driving stability is restored automatically. All functions are controlled directly from the terminal. Error messages are also displayed. There is integrated data logging. For convenient operation of the loader wagon, including from outside the tractor cab. High-end operating convenience as an option. This operator terminal lets you control ISOBUS machines from different manufacturers.